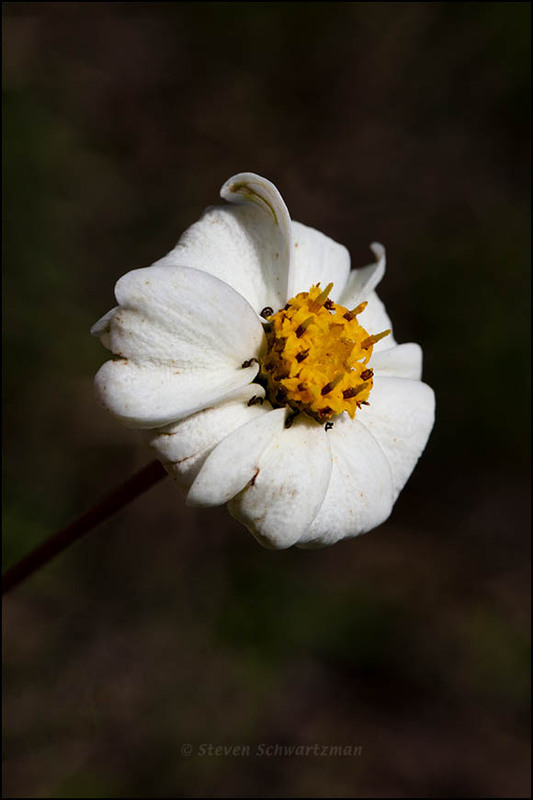 Way back on March 31st I made a portrait of a blackfoot daisy flower head, Melampodium leucanthum, along Yaupon Dr. in my extended neighborhood. 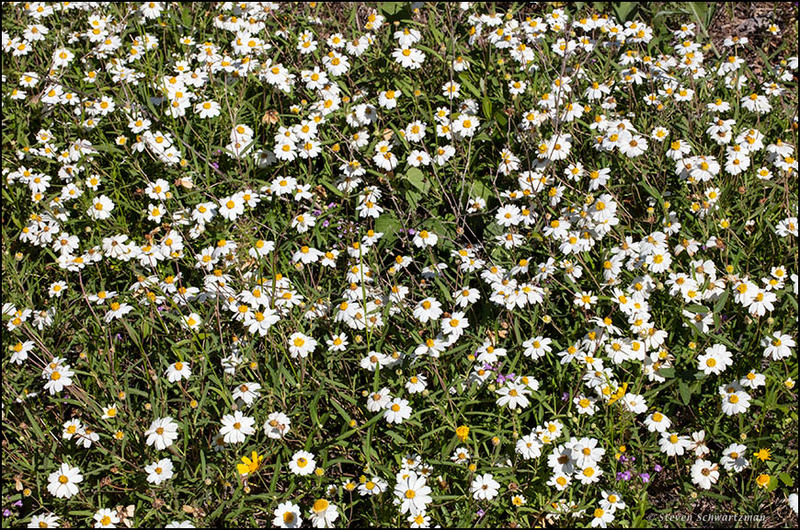 Then on April 17th I photographed a colony of flowering blackfoot daisies beneath the power lines west of Morado Circle. Do black-footed ferrets live among them? If so, I haven’t been able to ferret any of them out. This is a new one for me, I believe. It is sweet, with its recurved ray flowers. I checked and found that the species grows only in Texas in a few nearby states, which is why you haven’t seen it up there. Down here it’s common and can be seen for much of the year. I thought the name referred to the native American tribes, but looked it up and see it refers to dark coloring at the base. It’s a neat-looking flower, I’ve never seen one. Perhaps the Tribe was named after the flower rather than poor hygiene. It sort of makes one wonder how much information was lost, not only because those directly involved did not document it, but because those who came later did not find it to be important enough to document. I’ve occasionally thought the real wonder is that so many things have somehow survived. Most things are doomed to disappear quickly. Of all the people who ever lived, we know nothing about most of them. Sadly, I have found that even the relatively modern history of my hometown and adjacent towns has been ‘improved’ at the expense of accuracy. Perhaps not knowing is better than knowing. Goodness! This is about a native wildflower, not cultural anthropology! Yes, and I think that for the most part botanists don’t get caught up in ‘improvements’ of the sort you mentioned. When I first met this flower and learned its name, my first thought was of the Blackfoot nation, but I suppose that’s because its territory was much closer to where I grew up and especially to where we vacationed: in Minnesota and Canada. Until last year, I’d only seen it in native plant nurseries, where it tends to be pristine. I think that’s why I enjoyed that first photo so much. It reminds me of where I have seen it — along a barbed wire fence, and growing out of the same cliffs where I found the claret cup cacti — and of the way that all the stages of growth combine together in a more natural setting. The fact that you grew up relatively close to Blackfoot territory and vacationed even closer seems like a plausible explanation for your to link the flower and tribe. On the other hand, I’d heard about the Blackfoot Indians all my life but still never made a connection. Strange are the ways and pathways of the mind. The flower head in today’s post was beginning to turn brown, and while part of me didn’t want to show it, another part won out in showing what I just realized could be thought of as a Rembrandtesque portrait. Woo hoo for your wow! The flower is a bearer of light coming out of the dark.